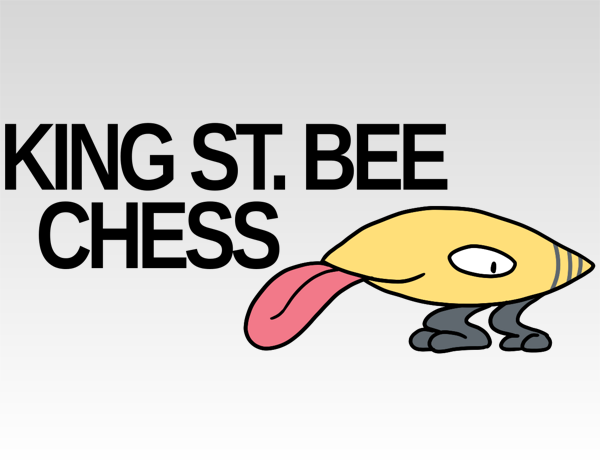 King St. Bee Chess is a one-page instructional guide on how to make chess bad and also not fun! Gather around the chess board and get incredibly frustrated as King St. Bee ruins your ability to play chess! It's King St. Bee Chess, the new and improved version of chess that stars everybody's vaguely bee-shaped creature, King St. Bee! Mix up your next game at the chess club by introducing King St. Bee to the other player's confusion! Not to worry - with this simple printout pamphlet, you can explain the rules easily to any angry competitor. Who is King St. Bee, you ask? She's the favorite little vagrant of Shokal, the largest city on the West Coast, who spends most of her time eating sand and chasing birds! Everybody loves her, and once you play King St. Bee Chess, you still won't understand why!